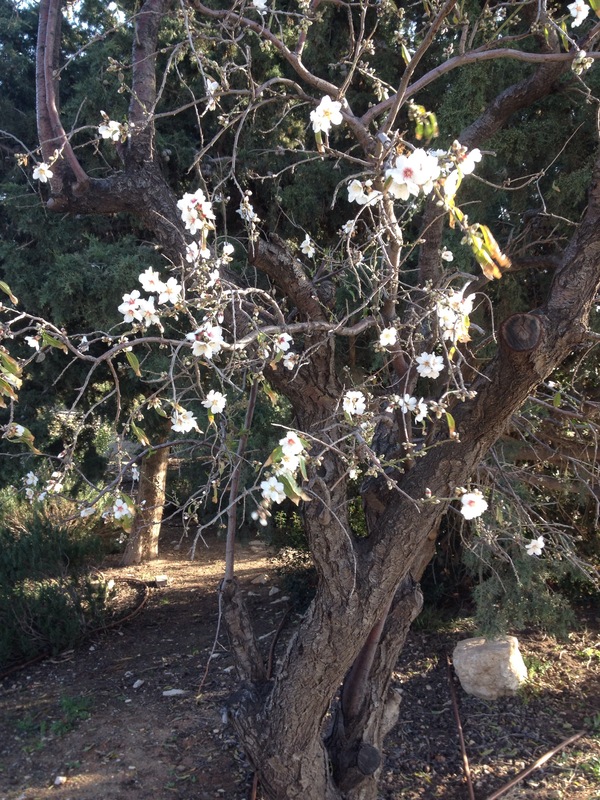 Well, the Almond Trees Are… Not Blooming. 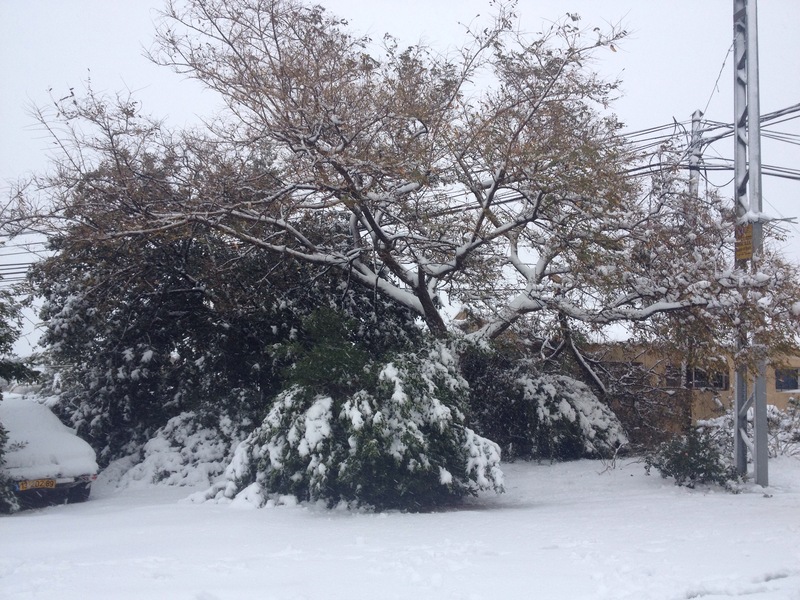 So, today was Tu B’shvat, that obscure little not-really-holiday that is the New Year for Trees. 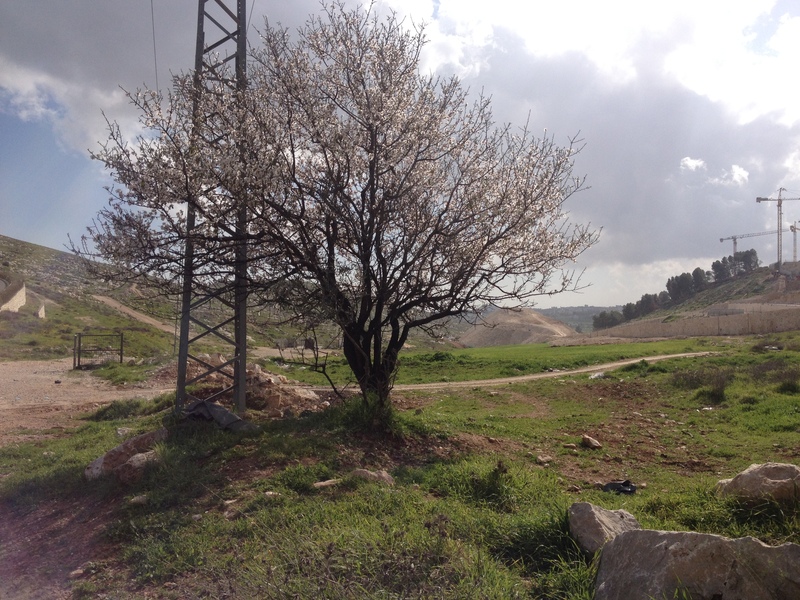 And despite the popular Tu B’shvat song I mentioned last year… the almond trees are not, in fact, in bloom. 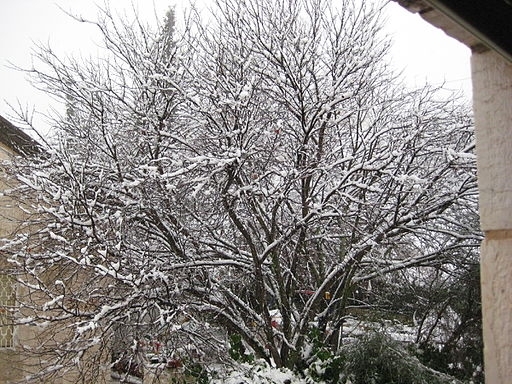 Actually, it’s supposed to snow in Jerusalem and the surrounding areas (possibly here) as of this afternoon. 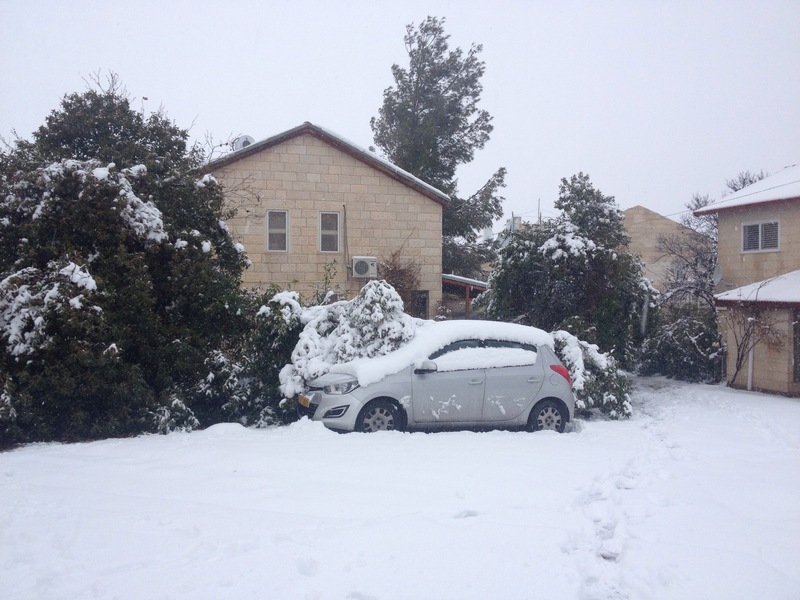 Jerusalemites and people in the higher regions of Gush Etzion have reported some flurries. You see, Tu B’shvat is “early” this year. And when you start using words like “early” to describe something that is supposed to occur on the same date every year, you start to understand the complications of living with a solar-lunar calendar. You see… the Muslims use a calendar that is 100% lunar. So for them there’s no such thing as an “early” or “late” Ramadan or Eid Al-Adha. 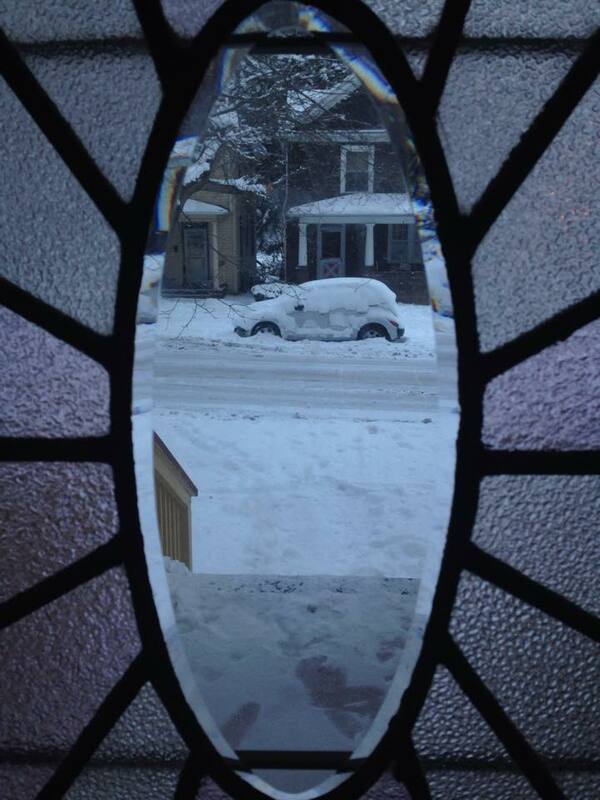 These holidays fall whenever they fall; the weather has nothing to do with it. But for us, it does, and here’s why. Passover has to fall in the spring: “You shall observe the festival of unleavened bread; for seven days you shall eat unleavened bread as I have commanded you, at the appointed time of the month of budding/springtime, for then you left Egypt, and they shall not appear before Me empty handed.” (Exodus 23:15) The seasons are dependent, obviously, on our position around the sun. So if Passover must fall in the spring, we need to manipulate our calendar to align, more or less, with the solar calendar. So when Tu B’shvat falls in January, we have a bit of a problem. Passover falls on the 15th of Nissan, meaning exactly two months from Tu B’shvat. The end of March may technically be spring, but it’s pushing it, and next year it would certainly be too early. Well, we need another month. So, we add another month. And what better month to celebrate twice than the happiest month of the year: Adar! Yup. This year there are going to be two months of Adar. That’s what we do on a Jewish leap year. In Hebrew they are called “shana me’uberet.” This is often literally translated as a “pregnant year,” which conjures up a pretty cute image; but it occurs to me that the root of the word “me’uberet” (מעוברת)–which is ע.ב.ר–means both “fetus” (“ubar”) and “passing” (“ma’avar”), so it could be that it actually just means “leap year.” But don’t quote me on that; I’m not a Hebrew scholar! You may recall that we do have a holiday right in the middle of Adar: Purim. So you may be wondering, if we repeat the month, do we also repeat the holiday?! No, unfortunately 😛 , we don’t. We celebrate Purim during Adar II. During Adar I, we do note what we call “Purim katan” (“little Purim”) on the 15th, but we don’t actually do anything special on that day. I know, I know. Two entire months without a holiday! How do we cope?!?! My kids came home early from preschool today–because of the storm–with various almond-tree decorated paraphernalia, and looking out the window, it seems almost as strange as it used to back in the USA, where the concept of almond trees blooming was completely foreign to me around this time of year. We are now in the full swing of Aseret Yamei Teshuva, the Ten Days of Repentance between Rosh Hashana and Yom Kippur (which begins on Tuesday at sundown). I’ve already posted about this period and these holidays, which focus on repentance and forgiveness. As I wrote there, the High Holidays are really about repentance as a community, but many use it as an opportunity to do some soul-searching on an individual level, too. There is a custom to take the opportunity to ask forgiveness of those you may have hurt in the past year. Josep asked me a while ago about forgiveness in Judaism, and I wrote him this e-mail last November to explain about the process of teshuva (repentance) in Jewish law and thought. Enjoy, and gmar chatima tova (roughly, may you be sealed in the Book of Life) to all. The above passage is part of a larger section towards the end of Deuteronomy, discussing the “blessing and the curse” that God gave the nation of Israel. It is considered the Biblical source for the commandment of teshuva (repentance). 1) No matter how low a person sinks, now matter how horrible his actions, he is always capable of redeeming himself and changing for the better. A story goes that Rabbi Israel Salanter, a famous rabbi who focused on the study of moral conduct and ethics, was walking down a dark street one night, and saw a faint light flickering in a window. He approached the window and saw a shoemaker repairing an old shoe by the light of a dying candle. Rabbi Salanter said, “Look how late it is! Your candle is almost extinguished. 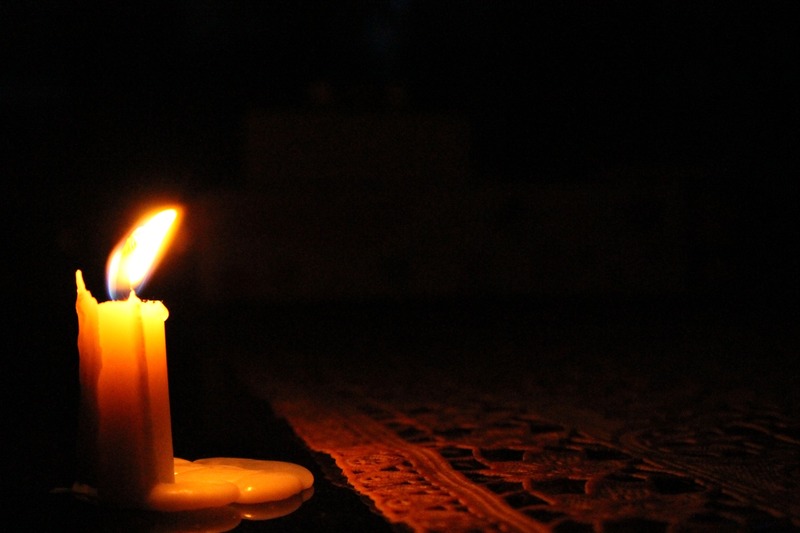 Why are you still working?” The shoemaker said, “As long as the candle burns, it is possible to mend.” Rabbi Salanter was struck by the deep allegorical wisdom in those words. In Judaism, the flame is a symbol of the soul. 2) God is infinitely merciful and anxiously awaits our repentance. This is true in Christian thought as well. In the liturgy for Yom Kippur, there is a line that reads, “Until the day of [man’s] death, [God] will wait for him, and if he repents–[God] will immediately receive him.” The image we have is of a God who is waiting for you with outstretched arms and great anticipation. He is like a father whose child has done something wrong, who is waiting anxiously for the child to say he’s sorry, so He can embrace him, forgive him, and end the child’s suffering from the distance between them. The word teshuva comes from the root ש.ו.ב., sh.u.v., which means “to return”. There is something very important to learn from this. It’s not just about returning to God. It’s about returning to yourself, to your “source”. We are all created with a Divine soul, and underneath all the layers, we are totally pure and good. Teshuva cleanses us from those layers. In another sense, however, teshuva changes us fundamentally. One might ask, I have done something so terrible–my act was real and tangible. How can it simply be erased, as if it were no longer there? The answer, from the Jewish perspective, is that maybe the consequences of the sin still exist, but the person who committed that sin no longer exists. You are not him anymore, and when faced with the same temptation, you would turn away and not do what he did. Maimonides (who wrote a very important work on the practical aspects of teshuva) actually recommends symbolically changing one’s name as part of the process to demonstrate that you are no longer the same person as the one who committed the sin. Bringing this together with the idea I mentioned in the previous paragraph, you are a different person–one who is closer to your source, to what you could be, to the potential of your Divine soul. According to Maimonides, there are four steps to the process of teshuva. Notice that the word for this is “regret”, not “guilt”. The word in Hebrew for guilt is אשמה, ashma, which comes from the root א.ש.מ., a.sh.m., meaning to blame. Guilt is self-blame. It is a natural emotion to occur when we’ve done something wrong, but it can lead us further down the spiral of self-destruction and negativity. Shame and guilt are the sense that there is something inherently wrong with you. The Hebrew word for regret is חרטה, ḥarata, from the root ח.ר.ט, ḥ.r.t., which means to chisel, to smooth, to engrave. To refine, to make a permanent and enduring change to something. Regret is the recognition that you are inherently good, and you have failed to live up to your potential. That what you did is not an expression of who you really are and who you really could be. This step is crucial, because obviously, if you don’t genuinely understand what you have done wrong, you can’t really change. And if you don’t genuinely recognize your own potential to be someone who would never commit that sin, there is also no way to move forward. This part is fairly obvious. To repent for a sin, you have to stop committing it. Both Christianity and modern psychology also recognize that thinking and feeling are not enough. We cannot truly be free of something that torments us until we have given it a name and spoken that name out loud. There is no special formula for this in Judaism, and it doesn’t matter where you are when you do it. All you have to do is speak to Him aloud, asking forgiveness, and explicitly naming what you did, in your own words. Unlike Christianity, this process is straightforward and does not involve a spiritual leader as intermediary. It’s just you and Him. Asking forgiveness from the person against whom you sinned is also a crucial part of the healing process–for both of you. Again, this has to be totally sincere. Whether that person is able or willing to accept your apology doesn’t have a bearing on your process of teshuva; what’s important is that you express your regret verbally to the person you hurt. Obviously, all of this doesn’t mean very much if you are not sincerely committed not to sin again. This is the real expression of the fact that you have changed. Maimonides says that teshuva is complete when you reach a point that when faced with exactly the same circumstances and temptations, you would make the right choice. The Hebrew month of Elul is just around the corner—Rosh Chodesh is this coming Sunday—and I have to say, it is my favorite time of year. There is something magical in the air towards the end of the scorching Middle Eastern summer, when a cool breeze wafts in and big, puffy clouds start to appear on the horizon, softening the once-brutal sun. Sometimes those clouds even bring with them a few drops of promise-rain. The sky, almost white during the end of summer from the dust in the air, clears to a deeper blue. The squill, a tall pyramidal flower with small white blossoms, pops up suddenly from the brittle brown of the sun-dried grasses. 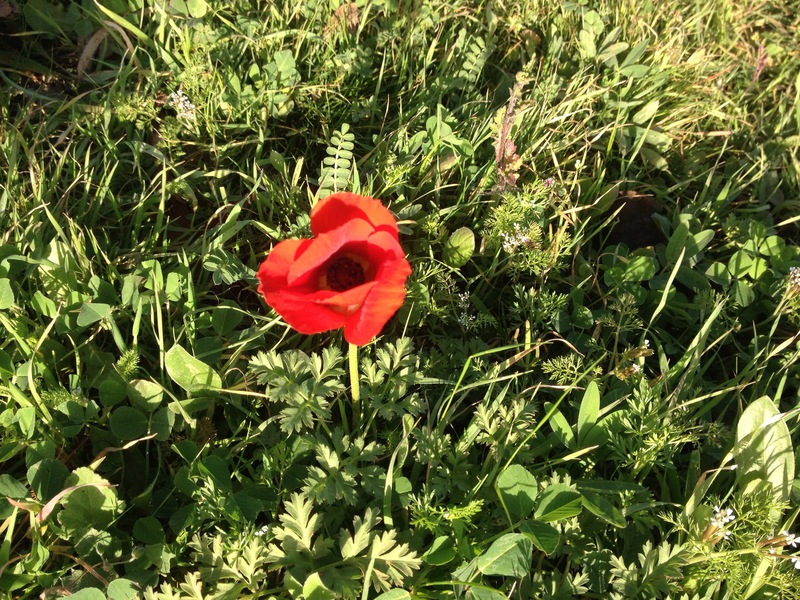 This flower, known in Hebrew as the ḥatzav, is the harbinger of autumn in Israel. And then there are the pomegranates. I never saw pomegranate trees growing along the coast where I spent my first decade in Israel, but here in Judea they grow wild and you can see them ripening during Elul. Best of all, you can buy massive amounts of them and stain your fingers to your heart’s content with their crimson juice, because they become the cheapest fruit by the kilo at our local supermarket when they’re in season. 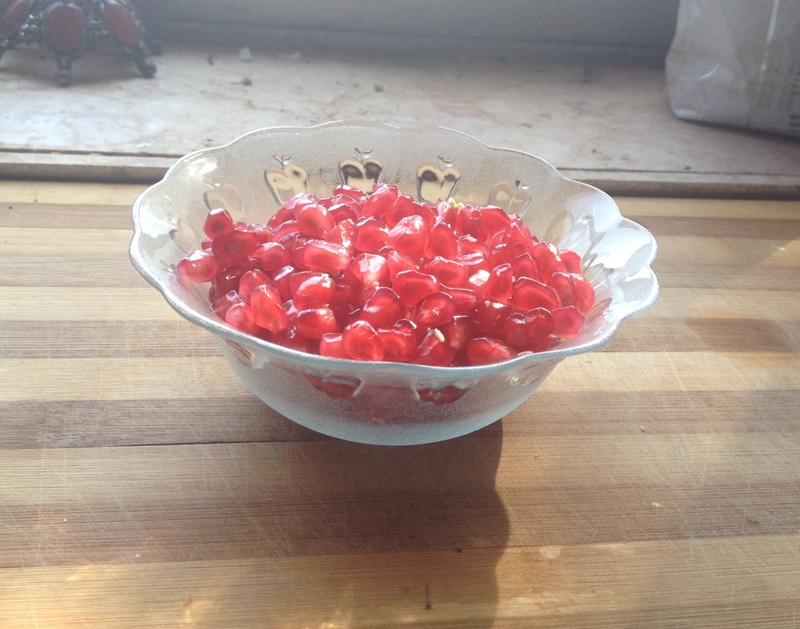 Nothing says Elul and Tishrei like the tangy sweetness of pomegranate. And look what I found at the supermarket today! That’s a shehechiyanu right there. From before sunrise on the first day of Elul and every morning until Yom Kippur, the Sephardi and Mizrahi men gather in the synagogue to recite seliḥot, the special prayers in the days preceding the High Holidays asking God for forgiveness. During the services, the rousing call of the shofar—the ram’s horn—carries into the streets from the synagogues. Throngs of tourists—most of them Israeli—flood to the old neighborhoods in the ancient cities of Jerusalem and Safed for “seliḥot tours,” visiting the many synagogues there with their different traditions, prayers, and melodies. Ashkenazim begin to recite seliḥot the Saturday night preceding Rosh Hashana, or, if Rosh Hashana falls in the first half of the week, the Saturday night before that one. Elul is a month of introspection, reflection, soul searching, prayer, and forgiveness. The Sages say that this month, “The King is in the field.” If God is compared to a king in a palace, where most of the time, it takes many hurdles and obstacles and bureaucracy to gain an audience with Him, during Elul it is as if He has flung open the palace gates and walked out towards you in the field. This allegory means that it is a time of particular spiritual closeness to God. I loved this time of year in high school. You know me, I’m a “soul archeologist” by nature and introspection is one of my favorite pastimes—sometimes to a fault!—so I especially loved activities geared towards making us think about spirituality and our relationships with God. They’d invite people, often Jews who used to be secular and went through a process of becoming religious, who would speak to us about their spiritual journey of teshuva (return to their spiritual roots). We would have concerts of soft spiritual music, and that music would stir awake the yearning for God that we often ignore. I have several memories of lying on the grass somewhere, looking up at a sky full of stars, singing softly, with tears pouring down my face, just feeling that strange mingling of an unquenchable yearning with an overwhelming sense of being loved by Him. These days I don’t have evenings of spiritual music built in to my curriculum, but I do have those clouds, that sky, that gentle breeze, the sound of the shofar echoing from the Sephardi synagogue near my home. I will elaborate on the Jewish concept of repentance, teshuva, in a later post. The first ten days of the month of Tishrei focus on teshuva as a national, collective process. The reason for this is that on Rosh Hashana—the Jewish new year, the first two days of Tishrei—it is believed that God figuratively “opens the books” and sets down all the decrees for the coming year, based on what we merit, deserve and need according to our deeds from the previous year. However, tradition has it, on Rosh Hashana God does not “seal” our fates; he merely “writes them down,” and does not seal them until the end of the tenth of Tishrei, which is Yom Kippur (literally “the Day of Atonement”). So during the ten days between lighting the candles of Rosh Hashana and the final shofar blast of Yom Kippur, we have the power to change those decrees, through teshuva, giving charity, and prayer. Now, as you will see in the letter about teshuva, on an individual level, we can change the spiritual influence of our sins at any time during the year. So the question arises, why do we need the Ten Days of Repentance? What does it mean that the decrees are “written” and “sealed”? The answer is that the Ten Days of Repentance are not really about individual teshuva, though they are an opportune time to focus on it. They are about teshuva as a community, as a collective. We are not really coming together on Rosh Hashana and Yom Kippur to pray for ourselves as individuals, and nor for just ourselves as a community; we come together to pray for the entire universe. Rosh Hashana is the Jewish new year because it is believed to be “the birthday of the world.” But it is actually not the day we believe the world was created. It is the day we believe that humans were created. That is, the sixth day of creation, not the first. So why do we count starting from Adam’s birthday, and not from the day God said “Let there be light”? Because the Torah’s focus is on humans and our role in elevating the universe spiritually. It is really all about us. The famous Hassidic rebbe, Rabbi Simcha Bunem, taught his students that they should carry two notes, one in each pocket, at all times. One note should read, “The world was created for me”; and the other should read, “And I am dust and ashes.” The idea is that on the one hand we should remember the greatness of the role and responsibility for which we were created; and on the other hand, we must remember that we are made of dust and will return to dust, and must balance that responsibility with humility. As Jews, our responsibility is that much greater, in that we believe God gave us a unique and crucial role in the process of spiritually elevating the universe. And during the Ten Days of Repentance, the weight of that responsibility is heavy. God asked us to be a light unto the nations, to spread knowledge of Him throughout the world, to abolish injustice and evil. And when we stand before Him on the day the world is judged, we have to answer for ourselves and what we have done, as a nation, in the past year, to further that goal. That is why the High Holidays (Rosh Hashana and Yom Kippur) are often seen as being very grave and serious holidays. They are also known as the Days of Awe. But they are also filled with joy, singing, celebration, and a strong sense of community. Rosh Hashana is a Yom Tov. Yom Tov literally means “good day,” and it applies to holidays that are listed in the Torah (the first five books of the Bible). What it means in practice is that it is a holiday that is celebrated very similarly to how we celebrate Shabbat; we light candles at the beginning and make havdala at the end, have festive prayers, eat two feasts (one at night and one during the day), and observe almost the same restrictions (barring certain activities that are related to preparing food). Now, in most cases, there is a difference between the duration of the holiday depending on whether you are in Israel or outside it. Inside Israel, a Yom Tov lasts one day. Outside of it, it lasts two. The reason is this: before we had calendars, Jews would calculate the months and the holidays according to observations of the moon. A month in the Jewish calendar, you see, can sometimes be 29 days, and sometimes 30. A witness for the Sanhedrin, the great rabbinical assembly, would have to sight the new moon and announce it to the rest of the nation. If you lived in Israel at the time, chances were that by the time the 15th of the month came around (which is when most Jewish holidays fall), you would have heard from these witnesses and would have an accurate calculation of the beginning of the month. If you lived outside of Israel, however, the news might not reach you by then. So Jews in the Diaspora observed two days of Yom Tov, just in case they had miscalculated and the holiday actually fell a day later than they thought. In the case of Rosh Hashana, however, the holiday falls on the very first day of the month, and there was concern that even those in Israel would miscalculate. Therefore, even in Israel, we observe two days of Rosh Hashana instead of one. Due to the intensity and significance of the High Holidays, the prayer services during Rosh Hashana and Yom Kippur are particularly long. There are so many additional prayers that we have special prayer books only for the High Holidays, called maḥzorim (literally meaning “cycles”). If a normal Shabbat morning service runs from 8:00-10:30, Rosh Hashana services will easily run until 1pm, depending on the congregation, how fast the cantor goes, how much singing there is, etc. One thing that is unique about the Rosh Hashana services is the blowing of the shofar. Remember this guy from the post on the Messiah? 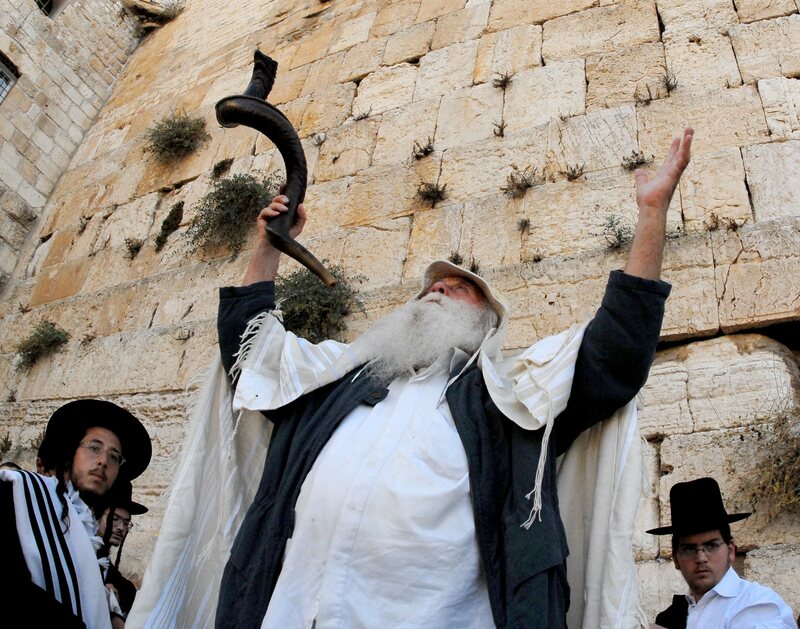 That’s a shofar in his hand. “Flickr – Government Press Office (GPO) – “Slichot” Prayer (2)” by http://www.flickr.com/people/69061470@N05 – http://www.flickr.com/photos/government_press_office/8005892765/. Licensed under CC BY-SA 3.0 via Wikimedia Commons. A shofar is a hollowed out horn from a kosher animal that is blown like a musical horn. It was used as a call to battle during Biblical times, and features in the story of how Joshua defeated Jericho. It symbolizes the ram that was sacrificed in place of Isaac, and its purpose is to “awaken” our souls to repent. My most poignant experience of hearing the shofar blown was actually not on Rosh Hashana at all. It was in the spring, in the Łopuchowo Forest in Poland. (More about my trip to Poland here.) We were standing over a mass grave there, where all the residents of the town of Tykocin were murdered by the Nazis. After a small ceremony we held in their memory, the principal of my school stood in front of us. “There are things,” he said, “that are so raw, so powerful, so great, that they can’t be expressed in words. Sometimes the only way to express how you feel is to cry out from the depths of your soul. And sometimes, even the human voice is not enough to give expression to this cry.” He reached in his bag and took out a shofar. “When I blow this shofar,” he said, “let it be your voice.” He blew it, and there wasn’t a dry eye in the crowd. Since that day, every time I hear the shofar I am transported back to that moment in the Łopuchowo Forest, with my soul crying out in pain, in yearning, in hope. That is the idea of the shofar. It gives a voice to the deepest cries of our souls. Now, as with all Jewish holidays, food has a significant role in the celebrations. 😉 As I mentioned, there are two feasts, one during the evening and one during the day. Like on Shabbat, the meals are preceded with Kiddush over wine and a blessing over two loaves of bread. On Rosh Hashana there is a custom to use round loaves of bread, symbolizing the cycle of the year. Additionally, there is a custom to dip the bread in honey, as a sign that we are wishing for a “sweet” new year. 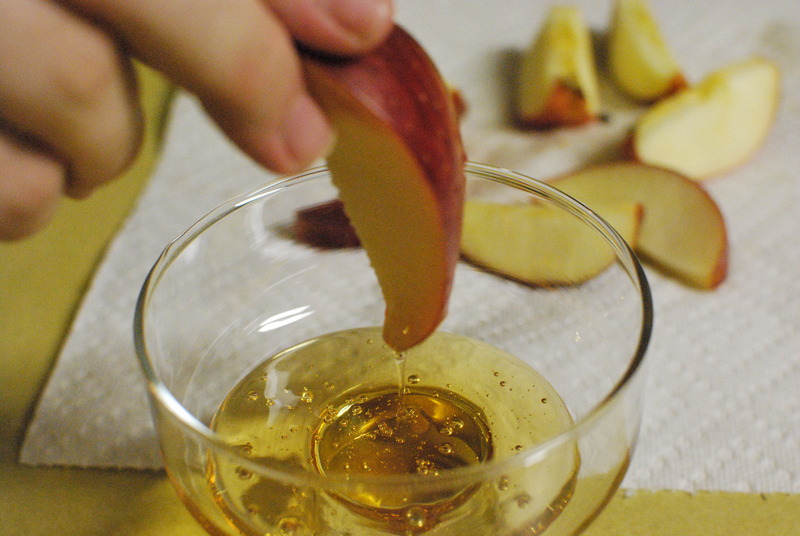 We take this further with the iconic symbolic food eaten on Rosh Hashana: apples dipped in honey. The apples, which are round, also symbolize the year. Many also have the custom to eat other symbolic foods, whose Hebrew names are reminiscent of other things we are wishing for. One of the most widely eaten ones, is pomegranates. 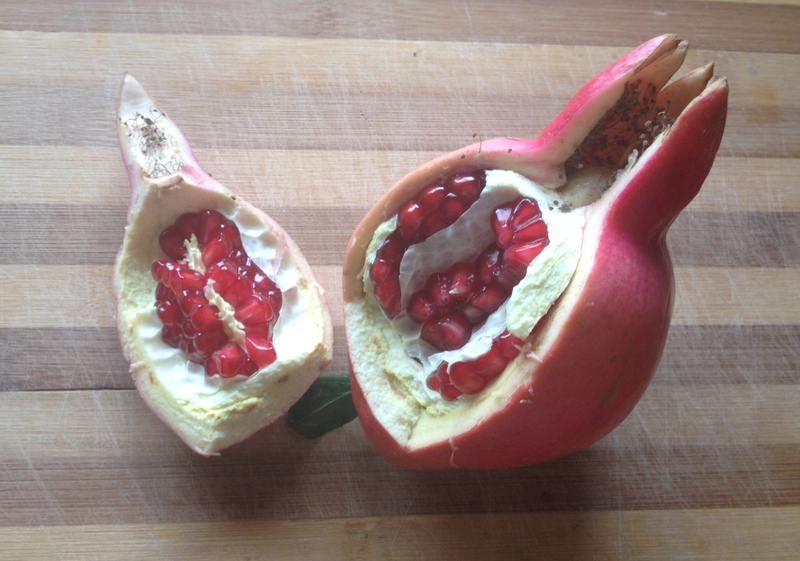 As I mentioned, the pomegranates are just starting to ripen. They are one of the Seven Species, and my personal favorite fruit. 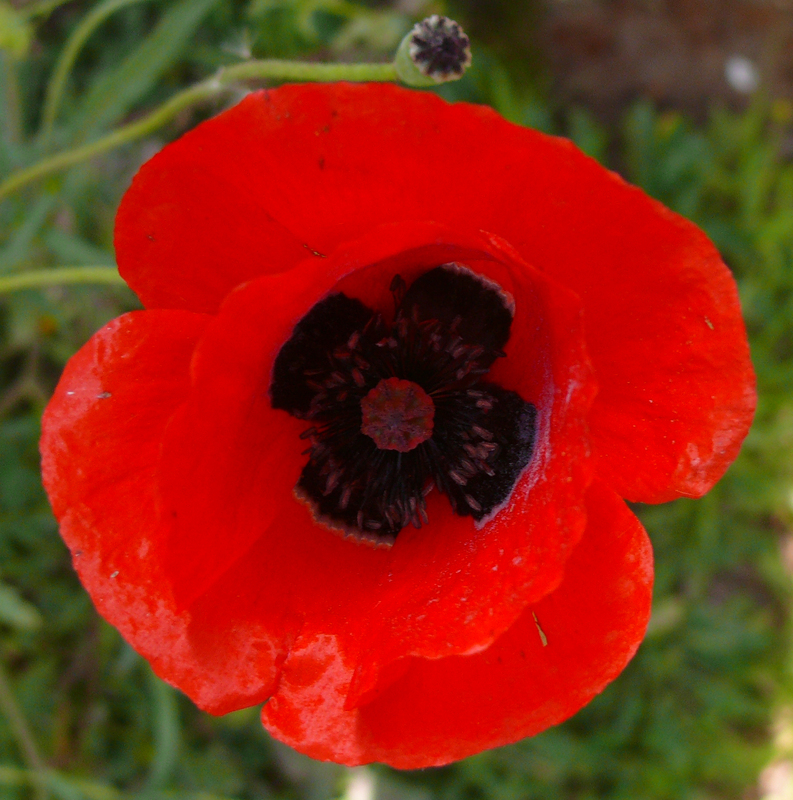 Their many seeds are symbolic of prosperity and fertility—and the Torah. You see, if you ever sat down and counted all the seeds in a pomegranate, you would discover that the number of seeds comes out astonishingly close to 613—the number of mitzvot, commandments in the Torah. I’m not counting. But they sure are pretty! I am constantly emphasizing that Judaism is about life on this world, about elevating the mundane and channeling our base desires for a higher spiritual purpose. Yom Kippur is the only day of the Jewish year on which we deny ourselves worldly pleasures rather than use them as part of our service of God and spiritual refinement. It is the day we try to be like the angels, which in Jewish thought are messengers of God or channels through which He manifests His will in the physical world, and thus have no will of their own. Many of us wear white clothing to symbolize purity from sin. In the evening, the first prayer is the famous Kol Nidre. Well, actually it’s not so much a prayer as a kind of juristic declaration that annuls all personal vows (ones you take upon yourself, not ones that involve other people) made in the last year, and declares it permissible to pray with outcasts and sinners. The origin of the formula is unknown, but it is believed that it was created during the Geonic period (the last half of the first millennium C.E. ), during a time of extreme persecution where many Jews were forcibly converted to Christianity or Islam. The common theory is that the idea of the passage was to welcome such Jews back into the fold and declare their conversions to those other religions null and void. One would imagine that it was a very important prayer to crypto-Jews during the time of the Spanish Inquisition. There are those who theorize that the haunting melody most commonly sung has its origins in pre-expulsion Spain. It is certainly reminiscent of the saetas in Andalusia during Holy Week. The morning services are also full of beautiful prayers and poems. If you ever get a chance to flip through a High Holiday maḥzor, I highly recommend it. It is really hard to describe the experience of the prayers of Yom Kippur. There is an intense sense of connectedness, both with the community, and with God; a sense of standing bare-hearted before the King of Kings, and saying, “I know I haven’t been all I could be, and I want to be better.” I used to say that Yom Kippur was my favorite holiday because it was the day I felt closest to God. These days, between fasting and taking care of little kids, it’s much harder to connect in that way. But even so, even if I manage to spend just a little time in synagogue, or take the time to say some of my favorite Yom Kippur prayers… it feels like peeling away the layers of my soul, one by one, sometimes painfully, to touch the Divine core of my being, and connect with He from whom that core originates. Because you see… what Yom Kippur really is, is the cleansing of our souls from the stains of sin, of doubt, of fear, of distance from God and from ourselves and what we want to be. 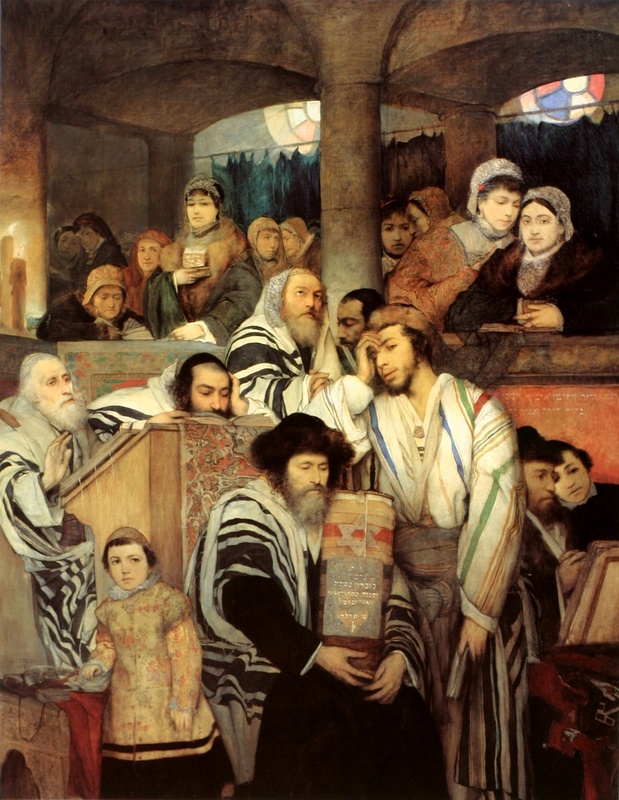 This 1878 painting by Maurycy Gottlieb, “Jews praying in the Synagogue on Yom Kippur,” is more haunting than it looks at first. If you look closely, you’ll notice that each male figure is a self-portrait of the painter at different stages of his life. The female figure is the painter’s wife at different ages. I think this painting is such a powerful visual representation of what Yom Kippur is and how it fits into the cycle of a Jewish lifetime. When the fast is over, traditionally, the first thing we do (after guzzling water and stuffing our faces with cake, of course), is start building the Succah (what’s that? Stay tuned!). Because that is the major mitzvah of the next holiday that comes up only five days later, and we want to act on our freshly renewed commitment to our covenant with God, and get the year off to a good start with our shiny clean souls. Wishing a meaningful Elul full of self-discovery and renewal to all of us, and may we be written and sealed in the Book of Life. 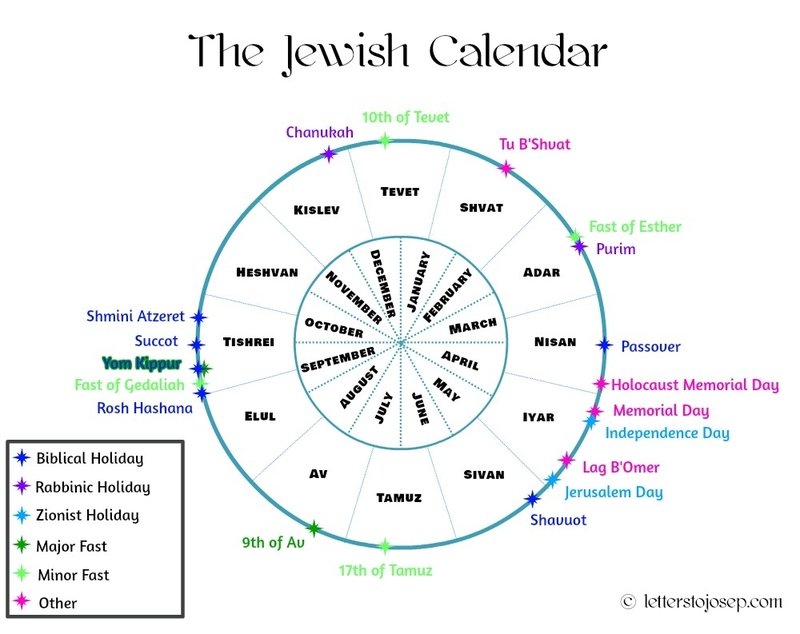 Your Personal Jewish Calendar Elaborates on… the Jewish Calendar. You once asked me where you could find a Hebrew calendar to help you keep track of the holidays and stuff, since, I quote, “I have you to tell me every single holiday, but… you can’t be writing to me every day of our lives to tell me all the holidays 🙂 And, of course, to have a different calendar makes it hard to keep updated every passing year, because it never falls on the same day…” Little did you know, you would be stuck with me as your personal Jewish calendar forever. Mwahahahahaha! Well, as I’ve said before, technology has been developing to our advantage. These days, you can have the Hebrew date displayed alongside the Gregorian date on your Google Calender really easily. (You go into Settings–>General and select “Hebrew calender” under “Alternate calendar”.) Unfortunately it does not mention the holidays, so you have to add the Jewish holidays separately. But that’s also pretty easy: you browse to your calendar, and under “Other calendars” click “Browse interesting calendars”, and then “subscribe” next to Jewish Holidays. Tada! The Hebrew calendar has 12 months and is mostly lunar but influenced by the sun as well. What that means is that the months are based on the moon, and each month begins with the new moon, but every few years we add an extra month to realign the calendar with the seasons. 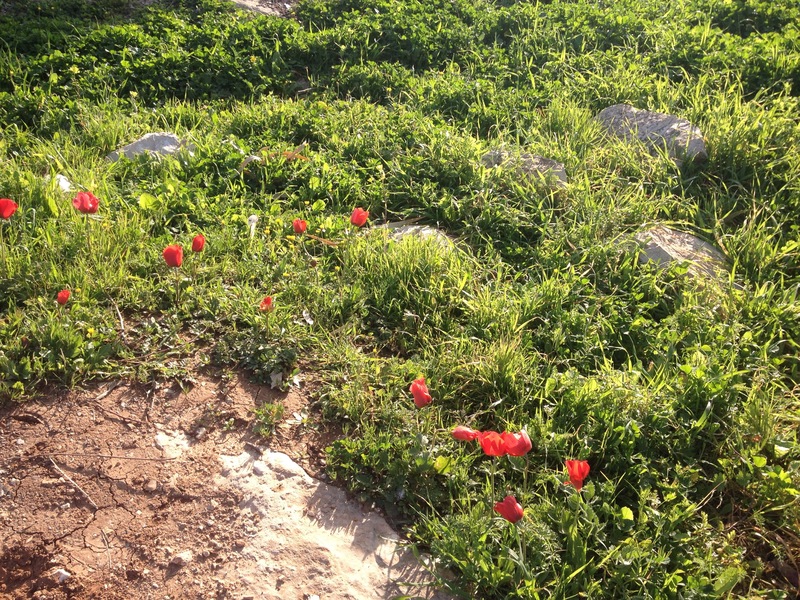 We do this because according to the Torah, Passover must take place in the spring. The Muslim calendar, by contrast, is only lunar, so their months and holidays fall during different seasons. The names of the Hebrew months (Nisan, Iyar, Sivan, Tamuz, Av, Elul, Tishrei, Cheshvan, Kislev, Tevet, Shvat, Adar) are generally understood to have been adapted from the Babylonian calendar. This makes sense, because our calendar was really consolidated during the time of Ezra and Nehemiah, returning from the First Exile in Babylonia. In the Torah, the months are not referred to by names, just “the first month”, “the second month”, and so forth. Pop quiz! Which month is the first month of the Hebrew calendar? You see, because Jews have a penchant for complicating things, we actually have four different new years. The first of Tishrei, otherwise known as Rosh Hashana or the Jewish New Year, is the new year for years. That means that we count years from that date, so 5774 turned to 5775 on the first of Tishrei. The first of Nisan is the new year for months. Nisan, not Tishrei, is the first month, and we count the months from there. That’s how Tishrei comes out as the seventh month. So when does Nisan fall? Usually around March-April; it’s your Hebrew birth month. 😉 The first night of Passover falls on the 15th of Nissan. The other two new years are a little more obscure, so stay with me here. The first of Elul is the new year for the tithing of cattle. There is a commandment to bring the firstborn of cattle to the Cohanim (priests), and the first of Elul was sort of the “fiscal year” for animals born during that year, similar to how taxes are calculated in countries where the fiscal year starts on a date other than the first of January. This new year is no longer observed, because we no longer have a Temple and the priests cannot receive these offerings. But Elul–which is the month before Tishrei–has taken on the significance of preparing for the High Holidays. The last of the new years is the 15th of Shvat, or Tu B’Shvat (because the number 15 is written as ט”ו, tet-vav, or the numerical value of 9+6. Why don’t we write 10+5? Because then it would be yud-heh, and that spells one of the names of God. 16 is written 9+7, ט”ז, for the same reason). This new year is used for calculating the age of plants or crops for certain commandments that have to do with agriculture, or for agricultural tithing. It has become known as “the new year for trees”, and has become a minor holiday on which we celebrate trees and their fruit. It is customary to eat the new fruit of the season on this day. The Kabbalistic mystics created a sort of ceremony, a “seder” (similar to the Passover seder), during which they eat symbolic fruit and discuss its significance. 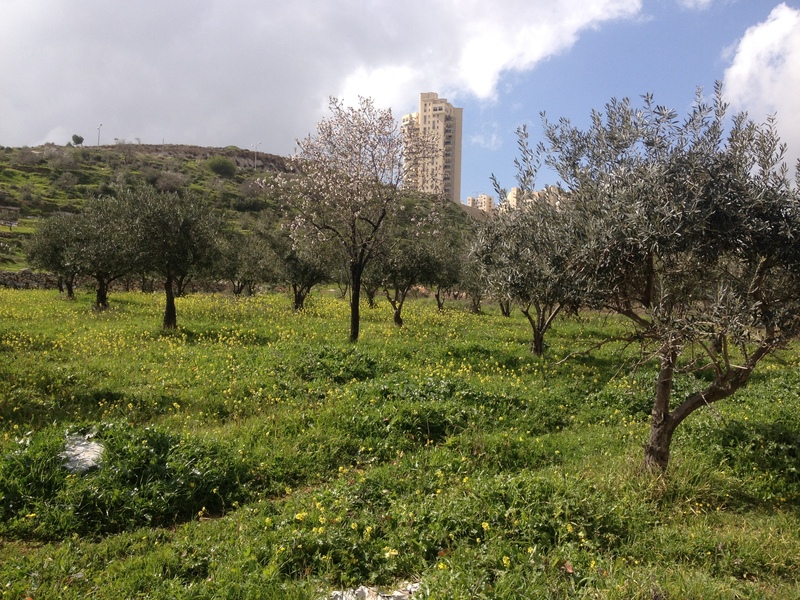 It’s also evolved into the Israeli Arbor Day. A day to plant new trees and to develop environmental awareness. And, as always, an excuse to eat delicious food. So. Why am I telling you all this now? And, well, you’ve experienced firsthand that my blessings have a fairly good record 😉 If there’s something specific you’d like me to pray for this Friday, let me know. 😉 Either way, you know I will be (and have been) praying for you. Blog readers: What do you think about what seems to be a conflict between the Bible’s calculation of the history of humankind versus the scientific calculation? What meaning does that number, 5775, hold for you?